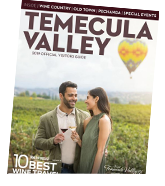 Sign up for Temecula&apos;s Enewsletter and stay up-to-date on events, activities, special offers and deals in Temecula. Find out about our current and upcoming events, special promotions and offers and other newsworthy information. We will not share your information with any source. We look forward to seeing you in Temecula Valley!